When Diana and I were fifth wheel shopping in 2011, we decided on a used mid-range unit that was affordable and fairly well built. We felt that we could move to a bigger rig and truck at a later date, but we really liked the layout of the Colorado. We had toured it at an RV show back in 2007 and immediately felt at home in it. Well, by golly…THAT’S not good. It turns out that we had three spots cracked in that fashion, and all were directly under the point where the cross beams were welded to the inside of the I-beam. I went into research mode and discovered that Lippert (the frame manufacturer) is well aware of this problem and has a recommended fix. 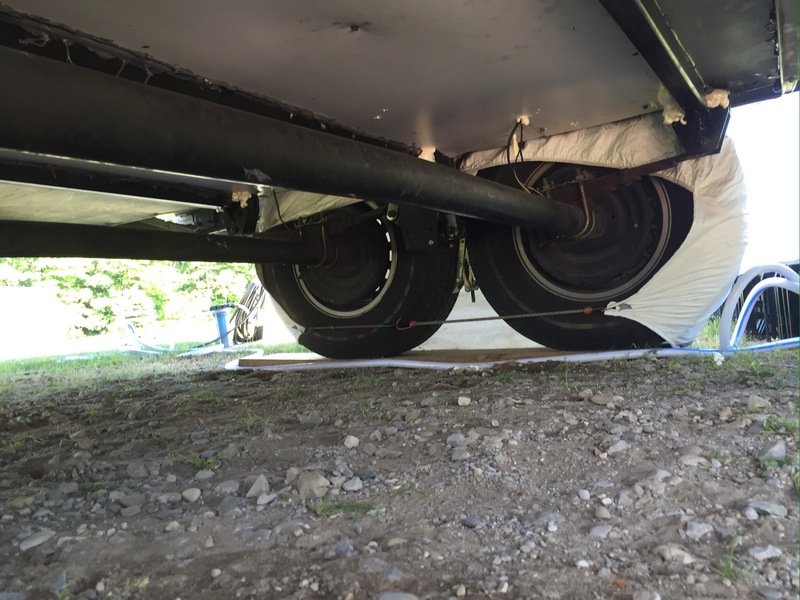 When a trailer with dual axles makes a turn, one axle is forced to one side of the trailer and the second axle is forced to the opposite side. Those forces are transmitted upward into the frame through the springs and spring mounts. The first thing to prevent that flexing motion are the bottoms of the crossbeams, and that’s where the cracks occurred. A boxed frame eliminates that flexing, as there are two pieces of vertical steel instead of one. Those frames are found on much more expensive trailers; something we prefer not to invest in at this time. 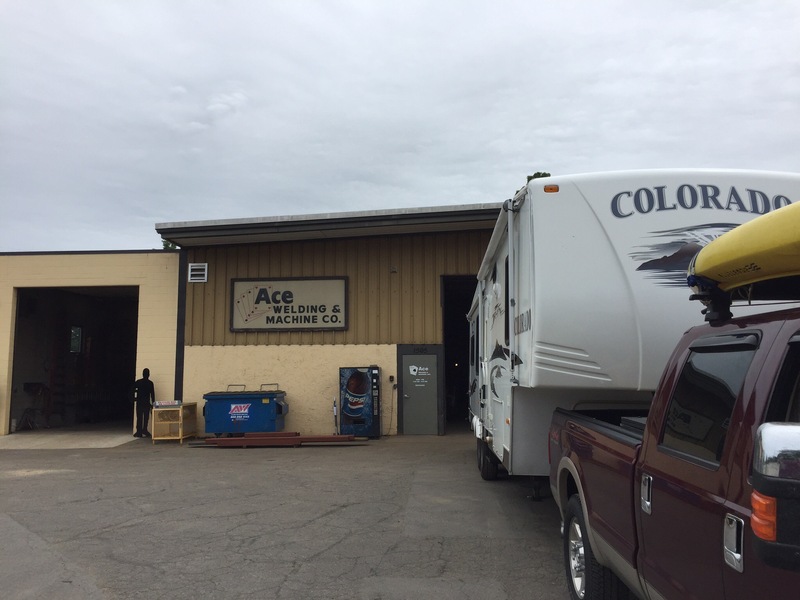 I discussed Lippert’s suggested repair with Terry at Ace Welding in Traverse City, and he agreed that it would indeed take care of the issue. After removing the protective underbelly from the rig, Diana and I took it in to have the work done. The recommended solution addresses the problem from both sides of the frame. On the outside, an angled piece of steel is welded over the frame, as seen below. That piece re-establishes the integrity of the I-beam. 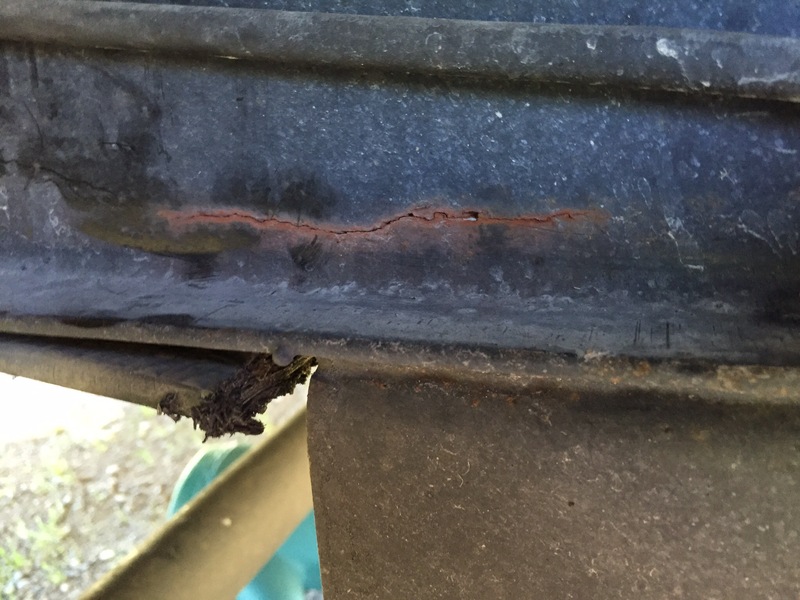 Note that Ace skip-welded, so as to not compromise the original beam with a continuous weld. 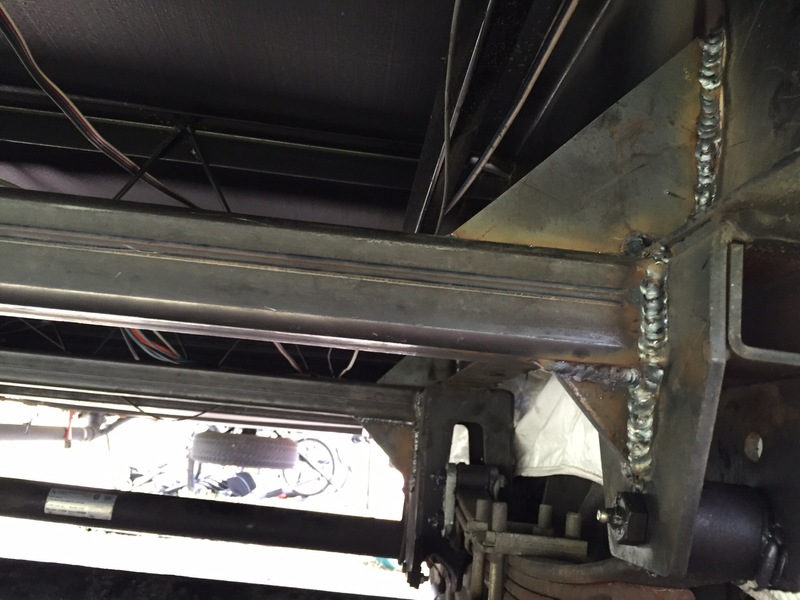 Lippert called for one long weld, and most welders will tell you that’s not a good idea. While we were there, Pat showed me a travel trailer he was working on. 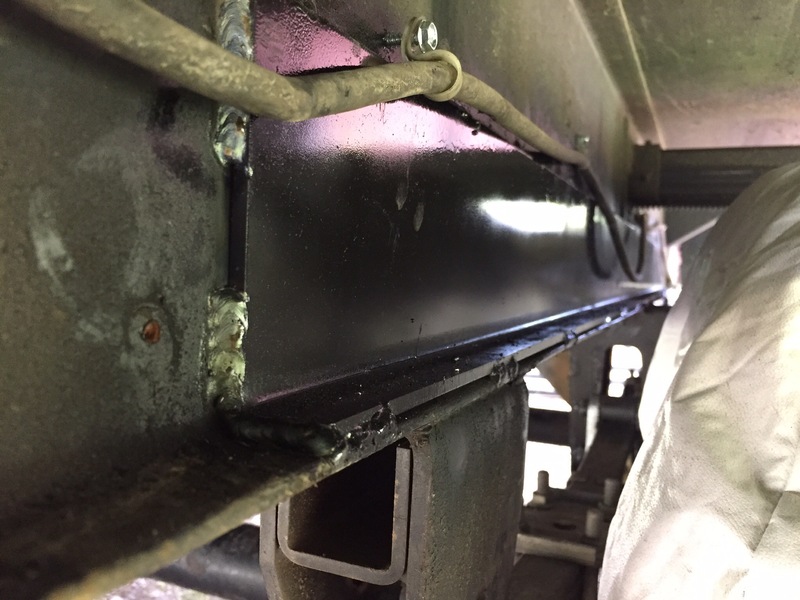 Instead of a true I-beam like we have on our Colorado, it had a 6″ assembled I-beam, made by welding three pieces of metal together in the shape of an “I”. There were very few cross supports, and there were NONE near the wheels. The frame had twisted to a point that the axles weren’t in alignment anymore. He was doing the same sort of repair as he was doing on ours, so I knew from the start that he knew his stuff. There are several other brands of fifth wheels near us with the same setup. While this piece of steel protects the I-beam from flexing, it really doesn’t protect the spring mount itself from twisting. The square tube and triangular gussets that are now on our Colorado will take care of that. 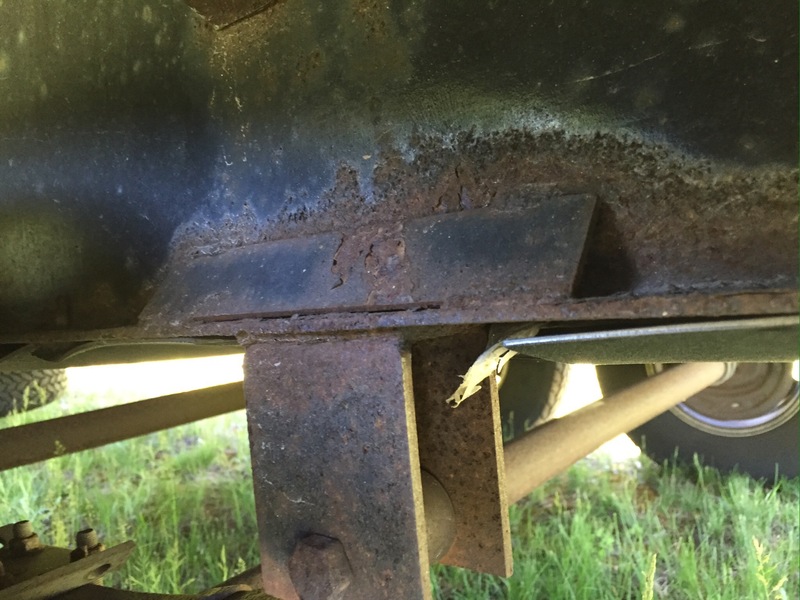 If you are looking at your own trailer for signs of cracking, make sure the spring mounts are in good shape. We also have an additional piece of “C” channel welded into each of our spring mounts (compare the last two photos) which offers some additional support at that point. I also noticed the heavy amount of rust on this unit. It appears it wasn’t powder-coated, or it spent time near salt water. 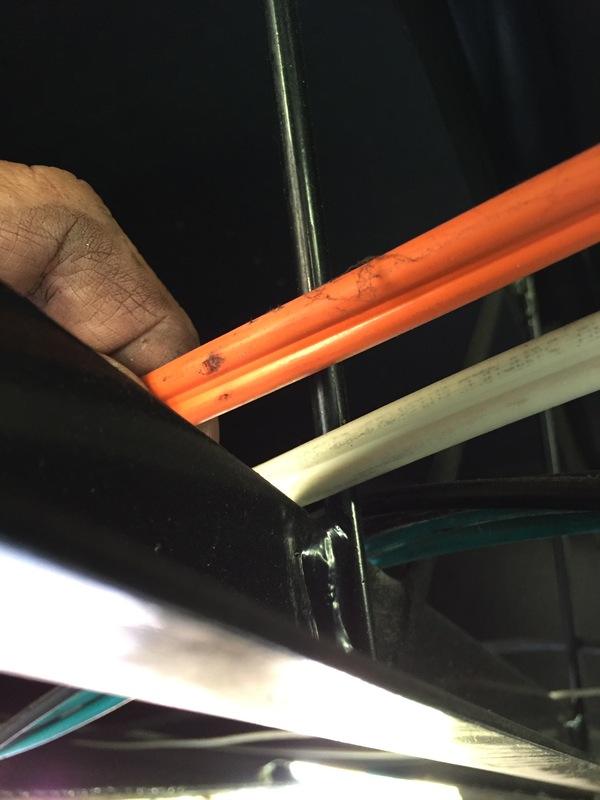 That orange cable is our main power cable, and it had been rubbing on the top edge of a piece of angle iron. It had not worn through, but it could have eventually. I taped it and then bundled wires together with zip ties. I also cut pieces of foam pipe insulation to fit over the angle iron. When we returned home from Ace, I painted the steel with a Rustoleum primer, followed by a Rustoleum automotive grade paint. I then reinstalled the underbelly. The piece between the wheels hadn’t come out intact, so I purchased some plastic wall panels from the local home center to fashion new panels for that area. I caulked and bolted those in, and I used expandable foam around the larger gaps near the spring mounts. Total cost of the project, with welding, panels, foam and caulk: less than $800. Hopefully, we should be good to go for several more years. As I stated earlier, we made a conscious decision to get a mid level fifth wheel as our first fulltiming unit. We still are confident that we made a good choice for us, as we have a decent rig for a fraction of the cost of an upper end RV. Who knows what direction we will move in the future, but for now…we are happy campers! Previous PostRolling Forward Through the PastNext PostIt’s Festival Season! Thanks for sharing, that is great information. I will check ours when we get back to Utah. Thanks, Jim. It’s definitely worth the effort to check! Thank you for that detailed description, one more thing to look for. 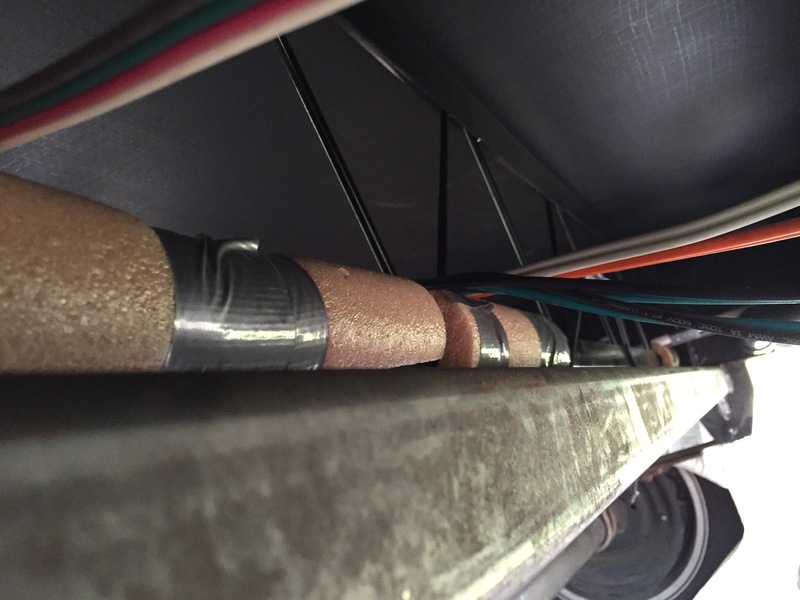 Yikes looks like checking these types of things is vital info for anyone owning a RV! Safe travels ahead. Thanks for the excellent write up. It caused me to go out and look at my frame. We made the same decision to buy a 2007 trailer when we went full time 3.5 years ago. It does require some repair, but we are still happy with our decision. Glad this was helpful to you, Shawn! I can see you looking under various rigs in the park……and folks wondering what you were looking for – missing pet, escaped ball ? Glad you got the fix you wanted and that you’ll continue to travel and live in a safe home. I’m glad you found the problem before it got even worse and possibly putting you in a bad situation. Maybe buy some wire loom at the hardware store and put that over the wires anyplace they might come in contact with things like the frame for added protection. Glad you caught before something more serious happened. Now the question, much new weight did the added steel add to your rig? Maybe 150 pounds, Brian. I also upgraded the leaf springs this week to 6000 pounds per axle. Looks like a nice clean job. What you had happen is one of the reasons that the idea of dual or triple axles on a trailer always bothered me, and one of the reasons I didn’t want to go longer than 40’ on a coach and need a tandem axle on the rear of our Class A. There’s no way around scrubbing which is hard on the tires, hard on the suspension, hard on the frame. I don’t know whether (especially) 5th wheelers can hear all the noises their trailers make going around tight corners. That scream that steel makes when it’s being stressed against other steel parts is never a good sign. The one ‘advantage’ of those pull-behinds is that because they are not as maneuverable in turns they are also a little harder to stress quite as much, but with the ability to put a 5th wheel into a 90º angle with the truck it’s possible to really torque the frame. Anyway…. glad you got YOURS sorted! Looks like a nice clean job. Those dual axles make for a smooth ride, though! I do know what you mean, Peter. If I roll the windows down when backing into a campsite on an asphalt surface, I can hear it. Best to not make really tight turns. You having any problems with WordPress today? Can’t get it to take replies. We have heard some horrendous metal noises from other 5’ers over the years. I think some drivers literally pay no attention to what their trailer is going through back behind them. Part of that is lack of lubrication on the shackles, Peter. Our new wet bolts quieted most of that down.